381 mm/42 Mk I4 х 2 pcs. 180 Degree Turn Time54.55 sec. 102 mm/45 QF Mk XIX4 х 2 pcs. 152 mm/50 BL Mk XVI8 х 1 pcs. Initial HE Shell Velocity914 m./s. 20 mm Oerlikon Mk IV13 х 1 pcs. 40 mm Vickers 2-pdr. Mk VIII4 х 8 pcs. Warspite — British premium Tier VI battleship. When commissioned, she was one of the mightiest battleships in the world that outmatched all previous dreadnought classes in firepower and speed. By the outbreak of World War II, Warspite had been modernized to receive more powerful torpedo protection, reinforced horizontal armor protection, and enhanced AA capabilities. Warspite was first released for sale worldwide on 30 June 2015. An archetypal battleship, Warspite represents all that a battleship was meant to do as one of the first superdreadnoughts sent to sea. This "Grand Old Lady" can slug it out at medium range, doing massive damage with her 15-inch guns while dodging torpedoes and shrugging off gunfire. The guns marginally outrange the 14-inch guns on New Mexico and although her Tier VI American counterpart can increase her range and her Japanese counterpart has the highest base range in the tier, this ship has better shell dispersion than the other two. Her defensive armament is decidedly average, with better secondary batteries than New Mexico and better AA batteries than Fuso. This is a warship that belongs just behind the cruisers in a battle line, providing fire support where needed and taking pressure off of less sturdy allies and in a Tier VI battle, a skilled player in a Warspite can have a huge impact in the match if circumstances are with them. Second biggest main battery of any ship at her tier. Excellent turning radius and good rudder shift time; decent speed. Stealthy for a Tier VI battleship; if the circumstances are ideal Warspite can fire off her salvo first, potentially rattling the enemy. Damage Control Party ( ) takes 90 seconds to cool down — like cruisers — much faster than 120 seconds on most other battleships. Repair Party ( ) is able to repair more damage than battleships of other nations. Surprisingly tight shell grouping compared to New Mexico and Fuso. Secondaries have much higher accuracy and shorter reload time in comparison to Japanese counterparts, and they fire HE making them excellent against destroyers and good at setting other ships on fire. Secondaries have 5.0km base range which can be pushed to 7.2km with Advanced Firing Training and Secondary Battery Modification 2 ( ). Takes a rather long time to reach top speed. Mediocre torpedo protection for its tier (24%). 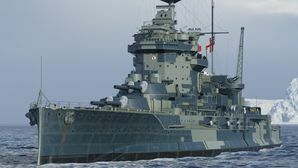 Fewer barrels than most Tier VI battleships; only Queen Elizabeth and Bayern have as few. Short maximum firing range of only 16.3km; cannot mount range upgrade mod like US counterpart to increase range. Slow turret traverse speed means she can't effectively respond to rapid situations, though Expert Marksman mitigates this slightly. Despite having a fast cooldown, Damage Control Party ( ) is only active for 5 seconds (like on cruisers and destroyers). Poor anti-aircraft defence. Struggles to inflict damage on same tier carrier planes and spotter planes. Extremely vulnerable to fires. You will burn alot. Questionable secondary armament arrangement, leaves her very vulnerable to attacks by destroyers to the rear. As a premium ship, Warspite doesn't have any upgrades to research. Warspite has a base range of 5.0km for its secondary batteries and also has strong survivability capabilities as its Damage Control Party ( ) takes 90 seconds to cooldown like cruiser and its Repair Party ( ) is able to repair more damage than battleships of other nations. A build that emphasizes both these strengths can be considered. Captains should invest in Priority Target, as the Warspite has a tight turning radius enabling it to dodge shells, Expert Marksman is a required skill as the Warspite’s turret rotation speed is abysmal. For the third skill, Superintendent maximizes the very strong Repair Party ( ) on Warspite. For the fourth skill, Advanced Firing Training helps Warspite with its AA and Secondary range, maximising its DPS output. With a build that has an emphasize on survivability captain can then take 3 three-points skill: Basics of Survivability for repairing fires faster, Vigilance to spot torpedoes from further away and use Warspite’s tight turning radius to dodge them, especially if the captain decides to brawl and finally Basic Firing Training to reinforce AA and Secondary batteries damage output. Alternatively to two of the three 3-points skill (Basic Firing Training, Basics of Survivability and Vigilance), captains can opt for taking Concealment Expert that allows them to disengage faster in order to repair and re-position and then chose a 3-point skill (preferably Basics of Survivability) and then opt for Jack of All Trades for an additional reduction in Damage Control Party ( ) and Repair Party ( ) cooldown. As a premium ship, Warspite comes included with Type 10 camouflage that lowers her detection radius, reduces the accuracy of incoming shells, and increases the amount of experience she earns. HMS Warspite seen refuelling at Port Victoria, Seychelles, 28th June 1942. HMS Warspite was a Queen Elizabeth-class battleship, the sixth warship of the Royal Navy to carry the name. The Queen Elizabeth class were a substantial improvement over their predecessors in the Iron Duke-class, introducing 15-inch rifles for the first time on a modern battleship. These modern 15-inch/42 Mk.I weapons were largely based off of the previous 13.5-inch Mk.V guns of the previous Iron Dukes, and were rushed into production, all prototyping being done on paper. Originally intended to have the same A-B-Q-X-Y turret arrangement the previous three classes of Royal Navy Battleship, the amidships Q turret was removed from the design as with just the eight guns of A, B, X & Y turrets, the ships had a heavier broadside shell weight thanks to the heavier shells of the 15-inch gun. The space freed amidships was devoted to larger machinery spaces, with Warspite receiving twenty-four Babcock & Wilcox boilers with four Parsons steam geared turbines. This increased the maximum speed of the class to 23/24-knots, although originally intended to be 25-knots. Another difference from the previous Iron Duke-class was the use of solely oil-fired engines, the first Royal Navy Dreadnoughts to do so, although the use of oil exclusively in the Queen Elizabeth-class meant that a secure source of oil had to be secured. The Queen Elizabeth-class also had modifications to the armour scheme compared to the Iron Dukes, as they had a 330mm (13-inch) belt compared to a 305mm belt. The secondary battery was also originally expanded upon, Queen Elizabeth receiving four more 152/45 BL Mk.XII (6-inch) guns, however these new guns fitted beneath the aft two turrets proved to wet and useless in most sea conditions, and thus were not fitted to Warspite. Warspite did however receive two 152mm/45 Mk.XII guns in open mounts on her deck, near the aft funnel, to complement the twelve 152mm guns still in hull casemates. The new Queen Elizabeth-class proved to be an outstanding success during the First World War, being resilient and fast, with the most powerful main armament of the time. Warspite was laid down at Devonport Dockyard, Plymouth, Devon, UK on the 31st October 1912, launched pre-world war 1 on 26th November 1913, and commissioned into the Royal Navy on the 8th March 1915. She would later be rebuilt extensively twice in the 1920s and 1930s, that radically altered her performance and appearance. Warspite was the second of the class commissioned, behind the lead ship Queen Elizabeth, and following trials, joined the Grand Fleet as part of the 2nd Battle Squadron. Her service in 1915 was marred by grounding in the Firth of Forth and colliding with sister ship Barham, but by the end of the year she was back in service. In 1916, to allow gunnery training of the Royal Navy's battlecruiser force at Scapa Flow, Warspite and her sister ships, now part of the 5th Battle Squadron were transferred to the battlecruiser force based at Rosyth. Hence, on 31st May 1916, Warspite and three of her sisters were part of the initial engagement with the battlecruisers, although being late in on the action due to a signalling error. Nonetheless, Warspite made her long ranged 15-inch rifles count, firing accurately and hitting SMS Von der Tann. The subsequent appearance of the entire High Seas Fleet and ensuing 'run to the north' saw Warspite damage the König-class battleship Markgraf among others, scoring several hits, although receiving two 11-inch hits from SMS Seydlitz during this time. However, just as the 5th Battle Squadron was turning to join up with the main body of the Grand Fleet, Warspite's steering gear jammed due to damage and operating conditions, and she performed two large circles in front of the High Seas Fleet, taking thirteen hits and only able to fire back using 'A' turret, but surviving and drawing attention away from the crippled armoured cruiser HMS Warrior also in the same vicinity. After regaining control and repairing damage, Warspite was ordered back to Rosyth for repairs, avoiding attacks from U-boats on the way. During the battle, she had lost 14 men. Her battle damage took two months to repair, and after the completion of repairs, Warspite accidentally collided with a destroyer a her sister ship Valiant, requiring more repairs. After rejoining the Grand Fleet, she participated in the usual exercises and attempts to draw out the High Seas Fleet, none of these efforts bearing fruit. Further bad luck struck when a boiler room fire needed 4 months of repairs too. After the war and surrender of the High Seas Fleet, Warspite joined the Atlantic Fleet, and attended a fleet review in 1924. From 1924 to 1926, Warspite was under refit, including replacing her original AA armament, and trunking her two funnels into one. After further service in the Mediterranean and Atlantic fleets, Warspite was again rebuilt between 1934 and 1937, but this time the refit was far more extensive. Speed was increased to 23.5 knots after six more modern Admiralty 3-drum boilers were installed, boosting her shaft horsepower to 80,000 from 56,000. Deck armour was improved in coverage and thickness over the magazines and machinery, submerged torpedo tubes were removed, and the elevation of the main guns was increased to 30 degrees allowing an increase in range, as well as improvements in fire control. Four of the 152mm secondary guns were removed, and four twin 4-inch (102mm) dual purpose mounts were added, alongside Octuple 40mm 'pompom' mounts. The superstructure was completely rebuilt into the 'Queen Anne's Mansion' style first seen on Nelson, allowing an aircraft catapult and hangars to be fitted amidships. Upon completion, Warspite rejoined the Mediterranean fleet. Upon the outbreak of war and the loss of the battleship HMS Royal Oak, Warspite was recalled north to serve in the Home Fleet, and was diverted away from rejoining the Mediterranean fleet after the German invasion of Denmark and Norway. She played a major role in the second Battle of Narvik, where eight German destroyers of Type 1934, 1934A and 1936 classes were trapped awaiting fuel. On the 13th April 1940, Warspite, accompanied by nine destroyers (Cossack, Eskimo, Punjabi, Bedouin, Kimberley, Icarus, Hero, Forester and Foxhound), and aircraft from the carrier Furious moved into Narvik fjord and either sank or forced the German destroyers to scuttle. The Fairey Swordfish floatplane aboard Warspite spotted land targets for Warspite as well as the positions of the German destroyers, and then bombed and sank the U-boat U-64. After this success, Warspite finally returned the Mediterranean. 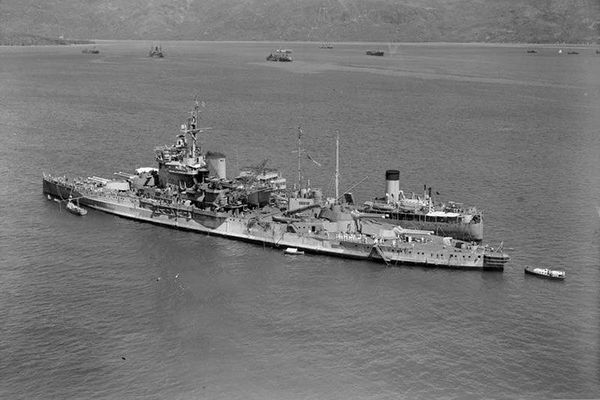 After escorting a convoy to Malta, Warspite played a major role in the Battle of Calabria/Punta Stilo on July 9th 1940, engaging the Italian fleet, and scoring one of the longest naval gunnery hits during battle in history, striking the aft funnel of the battleship Giulio Cesare at 26,000 yards (24km), setting off ready ammunition, causing the Italian Battleship to reduce speed after smoke from the fire entered the boiler rooms. However, Warspite had to circle two times to allow fellow Battleships Malaya and Royal Sovereign to catch up, as they were slower and modernised to a lesser extent. The battle ended inconclusively, with Warspite avoiding damage from attacking Italian land based bombers. She also escorted Illustrious during the raid on Taranto, and bombarded the Adriatic port of Vlorë. While escorting a convoy to Malta during Operation Excess, Warspite was lightly damaged by one aerial bomb. Warspite's next major action would be the Battle of Cape Matapan in March 1941, where despite missing action with the bulk of the Italian fleet which had withdrawn after an attack from the carrier HMS Formidable, Warspite and her sisters Valiant & Barham would use radar and the cover of night to assist them in sneaking to just 3,500m away from the Italian Zara-class cruisers, Zara, Fiume and Pola. After just 3 minutes of firing, Zara and Fiume were destroyed completely, and two Oriani-class destroyers were sunk. Pola was dead in the water after the attack from Formidable, and was scuttled by the destroyers Jervis and Nubian. After this success, Warspite and her sisters unsuccessfully bombarded Tripoli, and covered British & Commonwealth forces during the Battle of Crete in July, where she was hit by a 500ib bomb which killed 38 of her crew and tore the ships starboard side open. It was decided that Warspite should be repaired in the USA at Puget Sound, Bremerton, so the ship crossed the Pacific, stopping at Pearl Harbour on the way. After the completion of repairs in December 1941, Warspite sailed to join the Eastern Fleet in the Indian Ocean as flagship. In March 1942, intelligence suggested the Imperial Japanese Navy was going to use it's fast carrier striking force (The Kido Butai) in a raid on British territories the Indian Ocean, and although significant British shipping was lost and the fleets being close to engagement, no engagement happened, and Warspite withdrew to port. In September 1942, Warspite covered the Allied invasion of Vichy French held Madagascar, and returned to the Mediterranean in June 1943 after a few refits in South Africa and Great Britain. By this time, Warspite's catapult had been replaced by 20mm 'Oerlikon' AA guns. She covered the invasion of Sicily, and after avoiding aerial attacks at high speed at night, Admiral Cunningham made the comment that would give the ship her nickname of "Grand Old Lady". After the Italian armistice, Warspite met parts of the Italian fleet including Italia and Vittorio Veneto for internment at Malta. Warspite further supported the landings on mainland Italy, but while supporting the allied beachhead at Salerno, on the 16th Sepetember 1943, she was struck by a 'Fritz X' guided bomb and near missed by another, causing heavy damage to the ship. Warspite was returned to the UK via Malta and Gibraltar, and quickly repaired so she could take part in Operation Overlord, the D-Day Landings. However X-turret was non-operational, as was one of her boiler rooms, limiting her speed. Additionally, the 6-inch (152mm) secondary guns were removed. However, Warspite supported the D-Day landings at Sword beach with her remaining 6 operational 15-inch guns, being one of the first bombarding warships to open fire. After returning to Portsmouth to restock on ammunition on the 7th June, Warspite then bombarded in support of Utah and Gold Beaches. Warspite was sent to replace her worn out guns at Rosyth, Scotland, but hit a mine on the way, which after repairs limited her top speed to 15 knots. Nevertheless, Warspite kept on fighting in service, bombarding targets in support of land operations at Brest, Le Havre, and Walcheren (near Antwerp), until returning to the UK in November 1944, seeing no further action. Such was Warspite's poor material condition, that she was the first Royal Navy battleship sold for scrap after the war in 1946, despite attempts to keep her as a museum ship. However, while being towed to the scrapyard in 1947, Warspite broke her towlines and ran aground in a storm at Prussia Cove, Cornwall. Warspite remained aground here until 1950, when she was finally refloated and towed the short distance to St Michael's Mount & Marazion, and scrapping was complete in 1955. Warspite is one of the most storied British Battleships, as well as being the individual Royal Navy ship with the most Battle Honours, at fifteen. Warspite in game is represented in late 1942 to early 1943 condition. Her original World War 1 or interwar configurations does not exist in the game. The citadel size for Warspite in game is currently too large, as it includes non-vital parts of the ship such as frozen storage. This page was last modified on 28 November 2018, at 03:09. This page has been accessed 120,310 times.